1. You can’t stop using useful Japanese words. 3. You forget what words aren’t English. 4. You simply forget English words. 5. 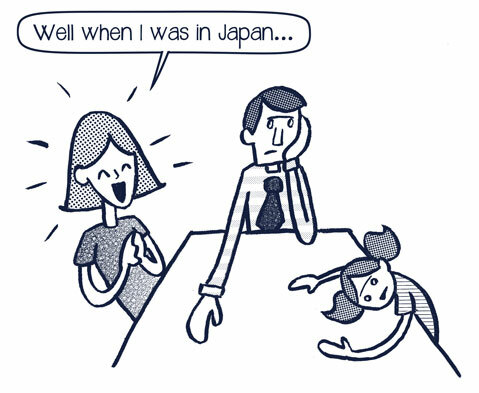 You use Japanese particles in your sentences. 6. You use Japanese English. 7. You talk to yourself in Japanese. 8. Your answers become more vague. 9. You make lame bilingual puns. 10. And lastly, you can’t help yourself. When a person returns to her home country – for vacation, for furlough, or permanently – tales of the land she just left will creep into her conversation. Sometimes we’re homesick for our adopted home. Frequently most of the stories from the past few years of our lives involve our adopted home in some manner. More likely than not, we wish there was someone who knew what we were talking about. When relief comes, it doesn’t necessarily arrive in someone who was in the same country or who spoke the same language. A taste of “home” comes when we meet someone who knows what it is like to navigate life cross-culturally. If we don’t have someone like that right in front of us, reading a book or watching a movie can have the same effect. I’ve been back just shy of three months now. I’m staying with my parents in a very rural area. They travel a lot but they’ve never LIVED outside of the country. In every other way my family is providing the support I need. For the emotional debriefing I do through reminiscing shared experiences, I have M*A*S*H*. Yes, that’s right, the television show that was on in the 1970s. My Dad watches it twice a day, Monday through Friday, and there are so many ways in which I resonate with that mobile medical unit. 9. A Book in English Is Like Gold – In Season 6, Episode 6, B.J. Hunnicut receives a mystery novel in the mail. And everyone wants to read it. Not because everyone is into mysteries but just because they want to hold in their hands a book written in English that has nothing to do with medicine or war. “What’s taking you so long?” Hawkeye nags. “I’m savoring it,” Hunnicut replies. In my 12 person group of ex-pat English teachers, we had a strange assortment of books that had been mailed over or left behind by previous teachers. Yes, we all had easy internet access. But sometimes we just wanted to hold a book in our hands and read. Maybe I was like that more than the others, for I kept the bulk of the library in my apartment. But everyone had at least a few books. It was just nice to know they were there. 8. Strange Bedfellows – The three surgeons at the M*A*S*H* unit share a tent. And they don’t get along. The first half of the series it is Frank who is irritated by Hawkeye and Trapper, and the second half of the series it is Winchester who trades barbs with Hawkeye and Hunnicut. But they don’t have a choice. They work with each other, they eat with each other, and they share a room with each other. It’s so cliche it’s hardly worth saying, but there is almost certainly someone on your team with whom you don’t particularly gel. And the closer you have to work with them the worse it is. But we deal, because we have to. 7. Sometimes, you just need to go a little crazy – In Season 7, Episode 2, Hawkeye gets sick of the war. I mean really sick of the war. He hops in a jeep and drives to where peace talks are being held. Later, when the MPs show up, Colonel Potter intercedes for Hawkeye, saying that while it was outside of normal army conduct, Hawkeye’s actions boosted morale for everyone at their camp. And, indeed, Hawkeye’s campmates welcome him back with party where everyone has abandoned the olive green of their uniforms and is wearing bright red. The best times I had in Japan were the ones in which I went a little crazy: when the whole gang stayed up all night at Round 1 (like Chuck E’ Cheese for grownups) for Bryan’s, and two years later for Beau’s, birthday. Or the free Monday between two high pressure weeks when three of us snuck down to Tokyo and went to Disney Sea. A quick trip like that might not seem restful, but that day at Disney refreshed my spirit in a way I desperately needed those next two weeks. 6. Sometimes everyone really is just a little crazy – In Season 6, Episode 4 a psychiatrist happens to be visiting, and Colonel Potter finds a way to urge everyone to pay him a visit. Some, like Major Houlihan, are in denial about the stress they are under. Others know something is wrong, but recognize that the fundamental stress they are under can’t be cured by one therapy session. The members of the M*A*S*H* unit are under a lot of stress because it’s war. We’re under a lot of stress just by definition of it being cross-cultural living. Not everyone will admit the waves of culture shock that go by. But it is there: affecting our daily lives, pushing buttons, and often blatantly obvious to our teammates even if it isn’t obvious to us. 5. When others leave, a piece of us dies – In Season 3, Episode 24, Lt. Colonel Blake receives his discharge papers and prepares to go home. Everyone is both ecstatic for him as well as sad. One year after I arrived some of my closest friends on the team returned to the U.S. The next day I had to keep reminding myself that they hadn’t died. Because that is what it felt like. 4. Oh, how we treasure those letters from home – In Season 6, Episode 21 Major Houlihan asks if Captain Hunnicut and Major Winchester have plans for the evening. “I have a letter from [my wife] that I’ve only read twice,” Hunnicut replies. I threw away a lot of things when I loaded up two suitcases and flew back. But I couldn’t bear to throw away any letters. They were too precious. 3. He Knows When You’re Awake – The M*A*S*H* unit lives in tents, so everyone knows everything about everyone. Except they still keep secrets from each other. And their secrets end up being the things they should share, because often they need a shoulder to cry on, or a hug. Most of my team lived in the same building. We each had our own apartment, but the walls were thin. I could tell when Rachel was skyping with her family. I knew when Esther was awake because I could hear her walking across my ceiling. During the summer, with our windows open, it was worse: I could hear Celeste sneeze from two apartments away, and I’d call out a cheery, “Bless you!” But we didn’t always tell each other the hard stuff. I didn’t tell my teammates the things of my soul and I kept my secrets. Life isn’t a television show, so I don’t know if it was better that way or not. Major Houlihan is rarely the character I resonate with in any episode, but in this scene she struck a chord. For though I’m in my early 30s, these past few months I’ve repeatedly mused about how old I feel. It isn’t the type of thing I tell most people because I don’t want to be brushed off with a, “You’re still young!” Chronologically, yes, I am. But my soul feels as if I’m in my 70s, as if I’ve already lived enough for a lifetime. 1. We keep going, even when it is hard, because it is important – the “classics” channel that my father watches, the one which features all of these M*A*S*H* episodes, broadcasts commercials featuring actors who played in those classic sitcoms and dramas. In one Mike Farrell, who plays Captain Hunnicut, recounts that the appeal of M*A*S*H* is that even though most people haven’t been to war, everyone can relate to the feeling of doing something that takes us away from our family and friends and the comforts we would like, and we do it because it’s important. In the end, it is nice to know someone else gets it. That even if people don’t understand why I chose to teach English in Fukushima prefecture for three years, the people who like M*A*S*H* might get it. And there are enough of those people out there that the show was kept on for eleven seasons. It’s enough. During the three years I spent in Japan I experienced stress. And often my way of coping with some of the stress was to turn to something fun or nostalgic or comforting. My first year this was Coca-Cola. I have loved cola for years, though I’m not picky about the brand, and this was also a go-to, albeit rare, beverage for me in the states. I rarely found Pepsi or RC or Coke in Fukushima prefecture, so…Coca-Cola! My teammates would make fun of me for drinking it in wine glasses, but to me it made sense. For them wine was a signal that it would be a fun evening and a time to unwind. That is what cola signals to me. Wine glasses happened to be the prettiest glasses any of us owned so that is what I would use. My second year I still drank Coca-Cola, but I also found myself eating at McDonalds quite a bit. Beef was expensive, as were pickles, and I didn’t use enough ketchup or mustard to have them around. This one sandwich managed to combine all of these flavors. And while “hamburg” is plentiful in Japanese restaurants, it is really more like meatloaf. Meatloaf is great…if you want meatloaf. I didn’t. So I would stop by the McDonalds in the Koriyama train station and that was a bit of escape. My third year I drank Coca-Cola, albeit not as much, as I had discovered I almost immediately gain weight when I do. I’m not making a universal health claim about soda because I think different bodies react in different ways to different foods. We know it is true of medication, so why wouldn’t it be true of food! I can eat cookies and ice cream and stay the same weight, but if I consume soda of any kind, I almost immediately gain weight. Since my stomach doesn’t react well to sports drinks, I drink soda when I have a stomach bug, and I usually exit the experience weighing more than I did before. McDonalds? Yes, I still ate there. But the novelty had worn off. I started buying beef at home occasionally, and taking a vitamin to make sure my iron levels stayed up. But that doesn’t mean I didn’t have stressful days, and those days I dreamed of Tokyo Disney. See, my family lived in Florida when I was in pre-school. We had season passes and would go on weekdays in September, November, and February when the park was comparatively empty. I’d been back to the park as a teenager when it was crowded and hot, but those early memories still dominate my perception. At first I wasn’t going to go to Tokyo Disney. After all, in Japan I should do Japanese things, right?! I should save Disney for the U.S., right?! Well, Tokyo Disney is unique in its own right, and I could write a blogpost about that. But the significant thing was that by my third year I’d checked a lot of the cool Japanese experiences off of my list. I didn’t do everything – I never did make it to Okinawa or Hokaido – but neither of those are practical for a three-day weekend. By year three I wanted the feeling of home. And Disney stimulated enough nostalgia to be that for a little while. And then I came back to the U.S.! Here I have all the American food, American television, and American English I want. But, sometimes it doesn’t quite feel like home. Please don’t misunderstand me: I really enjoy being able to talk to my friends on a cell phone and without negotiating time zones. But there are a lot of factors I won’t go into right now that mean life is still stressful and difficult at times. The stress doesn’t surprise me. What surprises me is that I still turn to those same items: I still yearn for a cola, I still want a hamburger, and when organic chemistry and chores get me down, I start mentally planning trips to Disney. Those coping mechanisms didn’t go away. I can’t explain it, but they are still here.